^ 1.0 1.1 Gottfried M. D., Fordyce R. E. An associated specimen of Carcharodon angustidens (Chondrichthyes, Lamnidae) from the Late Oligocene of New Zealand, with comments on Carcharodon interrelationships. Journal of Vertebrate Paleontology. 2001, 21 (4): 730–739. ISSN 0272-4634. doi:10.1671/0272-4634(2001)021[0730:AASOCA]2.0.CO;2. ^ 3.0 3.1 中国科学院动物研究所. 噬人鲨. 中国动物物种编目数据库. 中国科学院微生物研究所. [2009-04-11]. （原始内容存档于2013-12-14）. ^ Knickle, Craig. Florida Museum of Natural History Ichthyology Department. www.flmnh.ufl.edu. [2009-07-02]. ^ ISAF Statistics on Attacking Species of Shark. Florida Museum of Natural History University of Florida. [2008-05-04]. （原始内容存档于2010-05-25）. ^ Daley, Audrey. Shark. Hodder & Stroughton. 1994. ISBN 0-340-61654-7. ^ Hile, Jennifer. 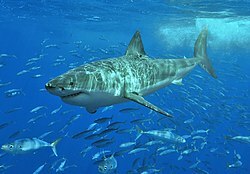 Great White Shark Attacks: Defanging the Myths. Marine Biology. National Geographic. January 23, 2004 [May 2, 2010]. （原始内容存档于2009-04-26）. ^ Carcharodon carcharias. UNEP-WCMC Species Database: CITES-Listed Species On the World Wide Web. [2010-04-08]. （原始内容存档于2013-06-16）. ^ The Great White Shark. "The Enviro Facts Project". [2007-07-09]. （原始内容存档于2009-06-13）. ^ New Ancient Shark Species Gives Insight Into Origin of Great White. sciencedaily.com. University of Florida. Nov 14, 2012. ^ Kevin G. N., Charles N. C., Gregory A. W. Tracing the ancestry of the great white shark (PDF). 2006 [2007-12-25]. （原始内容 (PDF)存档于2008-12-16）. ^ Areal Distribution of the White Shark. National Capital Freenet. [2010-10-16]. ^ Thomas, Pete. Great white shark amazes scientists with 4000-foot dive into abyss. GrindTV. April 5, 2010. （原始内容存档于2012-08-17）. ^ Thomas, Pete. The Great White Way. "Los Angeles Times". 2006-09-29 [2006-10-01]. ^ South Africa – Australia – South Africa. "White Shark Trust".